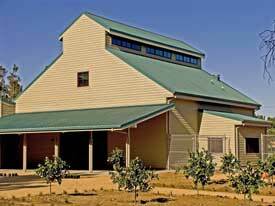 "Green" homes are built with recycled, reused, and environmentally healthy materials. Architects of "green" homes will use environmentally sensitive materials to recreate period style homes or incorporate recycled materials into new architectural design. The look of the house will often be dictated by the types of building materials used. The overall goals of this style are energy and water efficiency, a highly level of indoor air quality, and the use of construction materials that resist mold, mildew, and other allergy-inducing elements. A good example of a "green" home is at 416 W. Las Palmas Drive (2002), the first residence in Orange County to be built with the Perform Wall Panel System, a cement and polystyrene material that resists mold, mildew, termites, fire, wind, and earthquakes. The Fullerton Arboretum Visitor Center (2005) on the CSU Fullerton campus is also a "green" building that features natural ventilation and light, low-flow faucets and toilets, lighting with multilevel switching and motion sensors, and recycled materials for steel, exterior siding, insulation, and flooring. Giasone, Barbara. 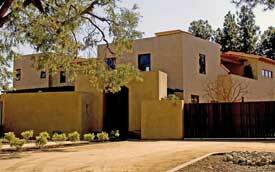 "House of Concrete: Home is 'Rising Like Legos' on Fullerton's Las Palmas Drive." Orange County Register,May 22, 2003. Harder, Nick. "Breakthrough in Block: A Fullerton Home Showcases the Latest Advances in Environmentally Friendly Construction." Orange County Home Magazine February 2004: 41-43. Low, Nicholas. The Green City: Sustainable Homes, Sustainable Suburbs. New York: Routledge, 2005. Roberts, Jennifer. Good Green Homes. Salt Lake City: Gibbs Smith, 2003. Robert, Jennifer. Redux: Designs that Reuse, Recycle, and Reveal. Salt Lake City: Gibbs Smith, 2005.